The Summer School for educators will be about the sustainable management of critical raw materials. 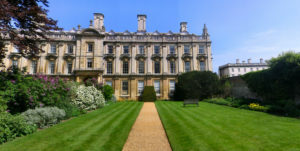 It will take place in beautiful Kings College, Cambridge. The School includes lectures, exercises and inspirational talks about criticality, responsible mining, geopolitical factors, different assessement tools and circular economy principles. These lectures and exercises will be given by Dominique Guyonnet from BRGM, Gus Gunn from the British Geological Survey, David Peck and Ruud Balkenende from TU Delft, Patrick Wäger from Empa, Steven Young from the University of Waterloo, James Goddin from Granta Design and invited guests. Furthermore, teaching concepts and learning outcomes will be analysed and discussed. The fee is 500 EUR (please ask for reduced rates if you are a student or teach for a non-profit organisation). This includes full programme, teaching material, all meals, drinks and snacks and networking activities. However, it does not include travel and accommodation costs. Click here to view the full draft programme! Please explain your motivation for joining the Summer School in a short text!